One bad habit that contributes to weight gain is eating while you’re doing other activities. Hands up if you’ve ever eaten while driving, surfing the ‘net or watching television. And that’s just the start! There a number of problems when it comes to this sort of multi-tasking. The sooner you break this habit, the sooner the weight will come off. You see, when you eat while doing other activities you can’t give the food your undivided attention. That’s a problem because you won’t hear your body’s hunger signals and you’ll eat much more than your body needs. Eating more calories than your body needs equals weight gain. You need to break the connection between food and activities and create a new habit of eating at the kitchen or dining room table only. Write down the activities where you crave food or have become “joined at the hip” with food. The most common ones are while watching TV, in front of the computer, driving and talking on the phone. Then, eat something before you start that particular activity while sitting at your kitchen or dining room table (if you’re hungry, of course – and don’t go over your calorie count for the day). The idea is to make a new connection between eating and your table, and break the connection between eating and the activity. So, for example, eat at the table before watching TV or getting online. Or have a snack before getting in the car (and don’t bring any food in the car). If you’re hungry while sitting in front of the TV or computer, get up and eat at the table. 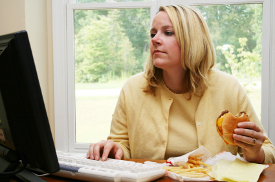 Same thing at work: move away from your desk and head down to the cafeteria or lunch room to eat. Breaking the food/activity connection takes some willpower and a bit of ingenuity, but it’s worth doing. You’ll enjoy your food more, you’ll reconnect with your body’s hunger signals and you’ll eat less calories and lose weight, too!